The world of optics is absolutely massive. To the point where it could intimidating. There are just so many options out there it can be scary to even know where to begin. The good news is we have you covered. We’ve put together an easy to follow guide that will leave you both informed and ready to make that important decision. Rifle optics are designed to enhance your rifle and to give you an edge. With that being said you need to be able to choose the best rifle scope for you, your rifle, and know what to do with it afterwards. We have you covered though, so dive in, and get started. Start here for the most basic scope knowledge. Including the terms and factors, you need to know to crack the market. Learn why matching a scope to a specific task is critical when it comes to choosing the right optic for you. 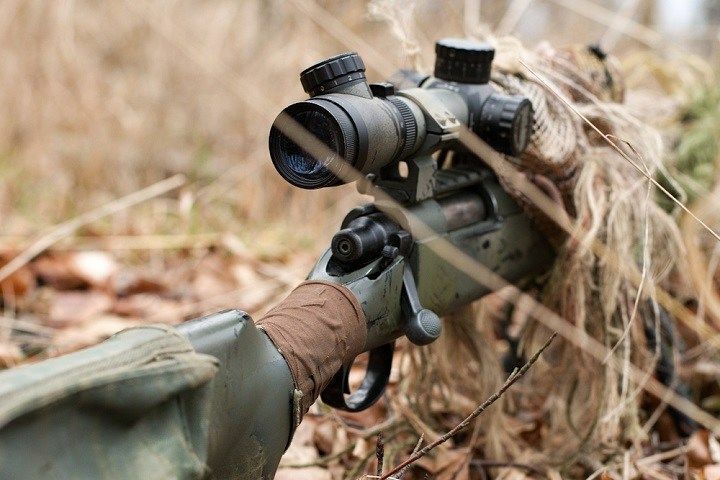 You know your rifle’s purpose, but have you matched your scope to your gun? Found out why you should here. These are my favorite scopes of choice, I make it easy for you to find an optic that’s rock solid & reliable for your specific need. Having a scope is one thing, mounting it is another. Learn how to install your scope like a pro here. Sighting in is vital to accurate shooting, and knowing the proper way will save time, money, and ammunition. Protecting your scope is like protecting an investment. We’ll show you how to store and maintain your optic here. Avoid making expensive mistakes by stopping here and learning the most common mistakes made when buying a scope. Welcome to the full world of rifle scopes. We hope to bring the definitive guide for rifle scopes and allow you leave here a little more informed. In the modern world, a rifle scope is an essential piece of gear. A rifle scope will let you see and shoot further, shoot faster, be more precise, and allow you to reach the full potential of your rifle. The optics and scope world is massive. It can even be slightly intimidating, but the more you know, the easier it will be make the right decision when choosing an optic. The best place to start is always the beginning am I right? So let’s start with the very basics of rifle scope knowledge. 3-9X means that the lowest level of magnification is three power and the highest level is nine power. In between, you have 4x, 5x, 6x, etc. in between 3 and 9. This represents a variable scope. A variable scope means you can switch the magnification. Variable scopes are only one type of scope. There are also fixed power scopes. Fixed power scopes have one magnification setting, and that is it. A fixed power magnification will merely be represented like this: 4X. Not all scopes feature magnification. Red dot scopes, for example, are 1X power optics. This means there is no magnification. Right after you read a magnification rating, you’ll likely see an additional, much larger number. This is your objective lens size, measured in MMS. So if you see 1-8x24mm the optic has a 1 to 8 power magnification rating with a 24mm objective lens. Often scopes with higher magnification levels will have larger objective lenses. 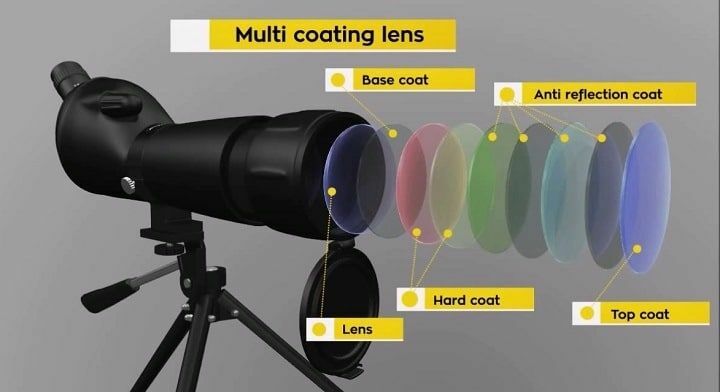 Objective lenses aid in light transmission and the higher the magnification, the more light you’ll need to see in low light conditions. The bigger the objective lens, the heavier the optic will be as well, and the higher it will need to be mounted on your optic. Fully Multicoated - Multiple layers on all air to glass surfaces. The Reticle is what you aim with when looking through the scope. A reticle can be a simple crosshair or a multi-purpose system that allows the users to compensate for wind and elevation at the same time. 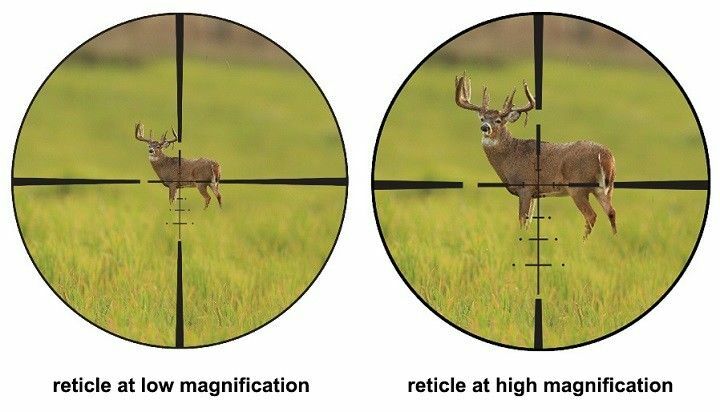 Reticles range wildly and are designed for specific purposes. This could be long-range shooting, tactical shooting, hunting, wind calls, and more. Eye relief is the distance your eye needs to be through the lens of your scope to see a full picture through the scope. Eye relief is anywhere from 3.5 to 11 inches, and beyond. The most common eye relief is roughly 4 inches. Longer eye relief scope is used for specific rifles, like scout rifles, or some milsurp guns that don't allow the ability to mount a scope in a traditional manner. If you are shooting a heavier recoiling rifle, you may want extra eye relief to avoid the scope hitting you in the eye. Or if you are commonly shooting up and down hills and mountains a more extended eye relief is needed so you can aim upwards. Your field of view is how far you can see in feet measured at 100 yards. This represents the picture you have from the left to the right side of your scope. The higher your magnification is, the shorter your field of view is. Rifles are very versatile guns. They can be used for just about any purpose. This includes everyday tasks like hunting, target practice, and into more complicated functions like long range competition, action shooting, and home defense and tactical use. Each of these tasks requires a different type of optic, and it’s critical to match your optic to your purpose. 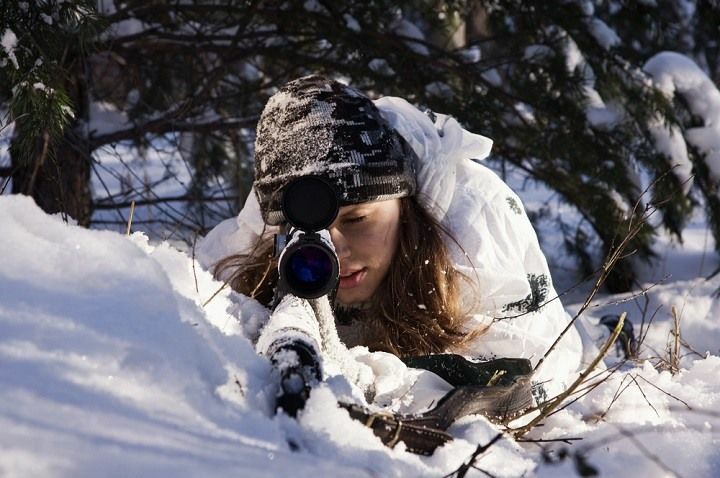 We are going to cover the most important and frequent tasks your rifle will be assigned to cover. 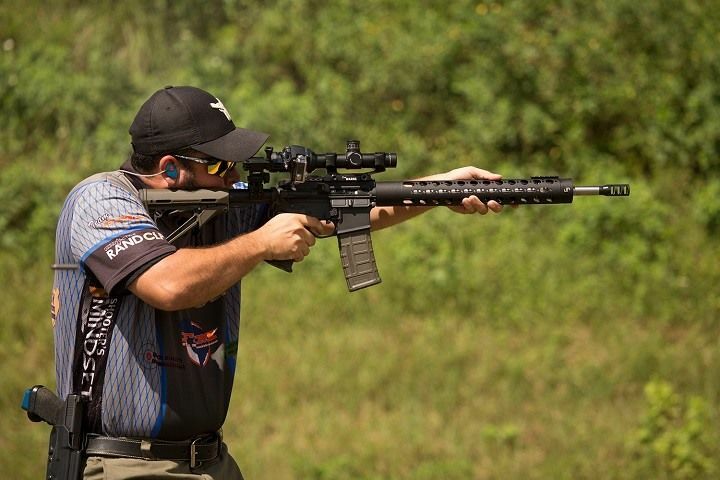 Speed and precision are critical with tactical rifles and their optics. Since tactical use in literally life and death, you’ll need to be willing to spend a little money to get the best. If lives at are risk why would you settle for less? 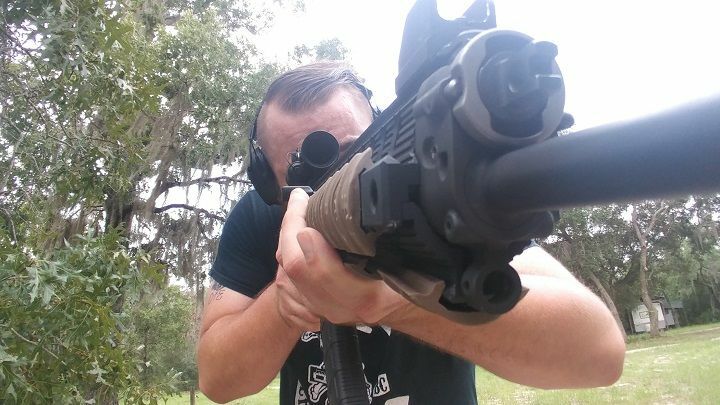 Tactical scopes also need to be strong, and capable of taking a beating. Rarely are tactical scenarios gentle. You need an optic that is waterproof, shockproof and fog proof. You’ll also likely want one compatible with night vision devices. Home defense optics need to be fast and furious. These optics are often low powered, or 1x optics. Since inside the home is close quarters you generally want something that goes with speed over precision. Having both is nice, but speed is the most significant advantage in CQB. This is why red dot scopes exist and why they function so well for Close Quarters Battle. 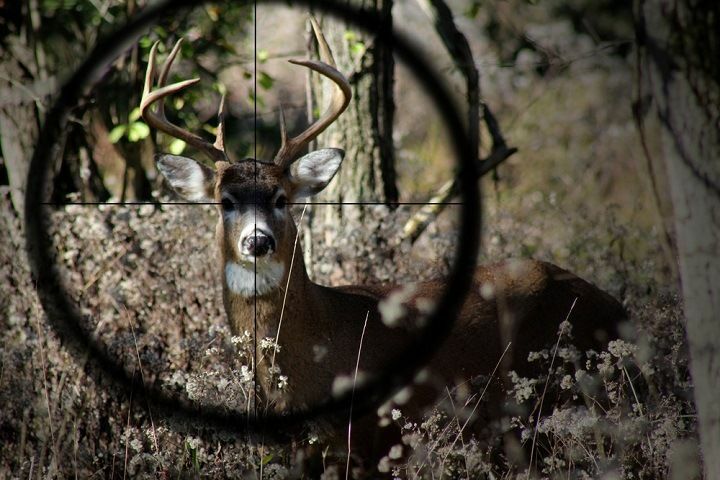 When it comes to hunting you’ll need a robust, field grade optic. These optics need to be built to withstand nature. This means they need to be moisture and waterproof, as well as fog proof and shockproof. You generally want an optic that has excellent low light performance. Most game moves as the sun is coming up and as it is going down. This means lots of low light shooting. Magnification wise a moderate power scope is often the best choice, with 2-7x and 3-9x being by far the most popular hunting rifle magnification levels. This allows hunting at both close ranges and decently long ranges. 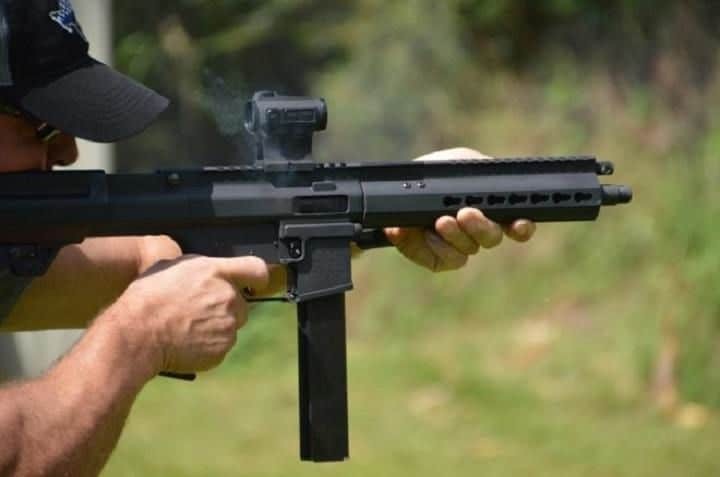 Action shooting sports like three gun have become extremely popular, and these optics have even spawned the popularity of low to moderate power optics. For action shooting sports optics that are 1-4x or 1-6x options are perfect and have become highly popular for this sport. Other options include red dots with quick flip magnifiers. 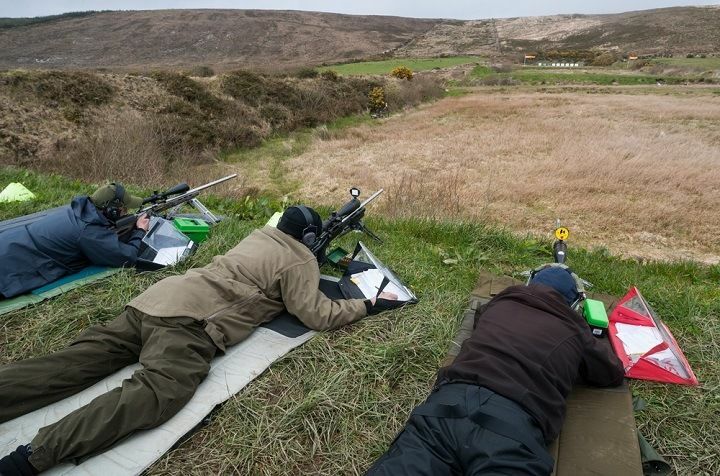 Because the sports are very dynamic, you’ll find yourself shooting a variety of different sized targets at a wide variety of ranges. This makes these 1-4x or 1-6x scopes perfect for these sports. Long Range shooting is a lot like tactical shooting, and you’ll have to pay to play. You’ll need optics with the highest quality glass, lens coatings, scope bodies and more. Companies like Night Force and Schmidt and Bender produce optics that cost several thousand dollars. They are often purpose-built for long range shooting and usually pack specialized reticles that allow for range compensation and wind calls. These optics range significantly in size, and magnification ratings can easily be up to 45x and beyond. Target shooting or plinking is done just for fun. You can use any scope you want for this task. In this category, you can choose whatever you want, and whatever matches the ranges you plink at. These optics can be cheap, affordable, and fun to use. There isn't too much needed here regarding specialized use or needs. This category gives you a considerable degree of freedom. Rifles are remarkably varied in design and purpose. Let’s not forget things like barrel length, caliber, and more all affect a rifle’s mission and the optic that will work best for it. We covered purpose above, and now we are going to take a peek at matching optics to rifles in general. These are just suggestions, and may not match every specific need, but it will cover the most general uses of each type of rifle. For your modern sporting rifle, like the AR 15, you are best matched with a moderately powered optic. A fixed 3 or 4 power scope is an excellent choice for most shooting purposes. That being said the MSR platform is incredibly adaptable and can be used with the most extensive variety of scopes. The MSR in specific configurations can be used out to decent ranges, and these rifles are the mainstay of action shooting sports and are well served with 1-4x style scopes. The MSR is also a trendy choice for home defense and perfect for a red dot. MSRs in intermediate calibers are served by most optics, but won’t ever need an extremely powerful optic. They don't have the range to ever need something super powerful. Pistol caliber carbines are rifles chambered for pistol calibers. These guns have recently become extremely popular and are used mostly for sport shooting, home defense, and plinking. In these roles, they are best served by red dot optics. Pistol calibers aren't known for their exceptionally long range potential. With that said you probably want to stick to a four-power scope at most. In my opinion, a red dot is a much better choice, but a 4x or less scope can be a functional choice as well. Bolt action rifles are most commonly used for both hunting and long range shooting. They can chamber massive cartridges, and they are perfect for precision roles in tactical environments as well. Bolt action rifles can be extremely accurate and are well suited with moderate to powerful scopes. Scope power should determine by caliber and intended purpose. It wouldn’t be uncommon to see something as low as a 2-7x scope, or something as substantial as a 15-45x scope. 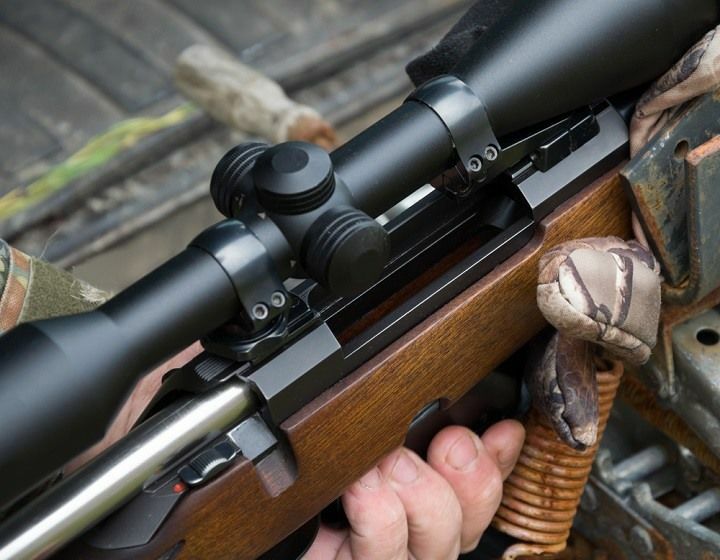 Variable scopes are undoubtedly the best option for bolt action rifles. Red dots and lower fixed power scopes are not appropriate for bolt action rifles. Their precision and long-range capability make this wasteful. Rimfires are very interesting when it comes to choosing a scope. First, they are low powered guns and are often used at short ranges. Right off the top of your head, you’re probably thinking red dot, or low powered fixed or variable scope. That makes sense until you remember that rimfire rifles are also commonly used for shooting small targets. This could be small targets on the plinking range like shotgun hulls, or small animals like squirrels. With small targets in mind, you may choose a more powerful scope, something like a 3-9x for seeing and shooting small targets at close ranges. For just general shooting and plinking a red dot or low powered variables works well too. When it came time to choose the best tactical scope I just couldn’t make a decision. It came down to two of my favorite optics The Aimpoint Comp M4 and the Elcan Spectre. The Aimpoint M4 is the best red dot sight on the market. It’s tough and made to take a beating. It’s currently in use with the US Army as the M68 CCO. This optic has been serving in war zones around the world for over a decade. It can even last 8 years on a single battery. This battery sipping device will just keep working, you can throw it, kick, submerge it, and more and it will just keep working. The Comp M4 is a powerful optic that’s well made and perfect for tactical applications. On the opposite side of the spectrum, we have the Elcan Spectre. Specifically the 1.5-6 power model. This is the best SCAR 17 scope, and this opinion is carried by JSOC. Overseas it's prevalent to see Elcan Spectres mounted onto SCAR 17 rifles. This optic is another extraordinarily durable and made to get the hell beat out of it. This optic is perfect for both close quarters use and extended range uses as well. These optics are powerful perfect for a DMR rifle. The Nikon Pro Staff is a popular line of affordable, but high-quality optics aimed at the hunting realm. My favorite model and the one I suggest for hunting is the ProStaff 3-9X40mm model. It’s one of the best 3-9x scopes for hunting and is both simple and reliable. The Pro Staff is a simple scope and its one that really excels at the basics of being a quality optic. It provides crystal clear fully multicoated lenses that delivers you a crisp and clear sight picture. You can see the fine details of a target, even when it's slightly camouflaged by nature’s design. The vivid sight picture is perfect for hunting in low light situations, and since most hunting occurs in the early morning and late evening this is a must-have. The Nikon Pro Staff has a zero-reset turret system that makes it easy to make field adjustments. This is one of the best scopes for 308s, 270s, 30-06s, and even 223 caliber rifles. It’s versatile, reliable, easy to use, and best of all surprisingly affordable. Nikon has been killing it in the scope realm and the Pro Staff is one of their best. 3 Gun is a dynamic, fast-moving and fun sport that is catching fire in the shooting world. It involves the use of pistols, rifles, and shotguns and this is where it derives the 3 Gun name from. The rifle portion is one of the most dynamic portions of any match. Target ranges can be anywhere from 10 yards to 150 yards away. In this situation, you need a versatile scope for close and extended ranges. The Vortex Optics Strike Eagle is a 1-6 power optic with a 24 mm objective lens that runs like a champ. The 1-6 magnification level allows you to touch targets anywhere from 3 yards to 300 yards. The Strike Eagle is the best 3 gun scope out there for the money. 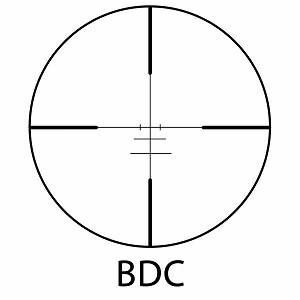 When equipped with the AR BDC reticle its one of the best scopes for 223 as well. The Strike Eagle is also a tough as nails optic that’s water, shock, and fog proof. The fast focus eyepiece allows you to get on target quickly and make the snapshots possible. The lenses are crystal clear, and the reticle is illuminated with 11 different illumination settings. The Strike Eagle is an amazing 3 gun optic and really lets shooters dial into their chosen target and take it out with extreme prejudice. The Strike Eagle is a capable optic with a long history of success. The AR 15 world is massive and finding a rifle and optic on a budget is very easy to do. Choosing one best AR 15 scope is hard because the weapon can be used for so many different tasks. It’s great for home defense, competition, sport shooting, and even hunting. It’s hard for one scope to fill so many roles, but I think I have one. The Bushnell Optics Drop Zone AR scope is one the best budget scopes out there. At this price point is the best 1-4x scopes I’ve ever used. It’s tuned specifically for your AR 15 rifle and features a very easy to use reticle system. The reticle is tuned to the 5.56/223 round and allows you to easily take long-range shots. The 1-4X nature of the optic makes it very versatile, and it can be used for hunting, sport shooting, and even self-defense. It’s one of the best coyote scopes and could even be used for hog hunting applications. The Bushnell AR Drop Zone Scope offer excellent close quarters combat. The Bushnell Drop Zone AR optics offers fingertip adjustments for quick and easy field modifications. The Drop Zone reticle is easy to use, the fast-focus eyepiece makes it easy to get on target, and overall it's a brilliant scope. 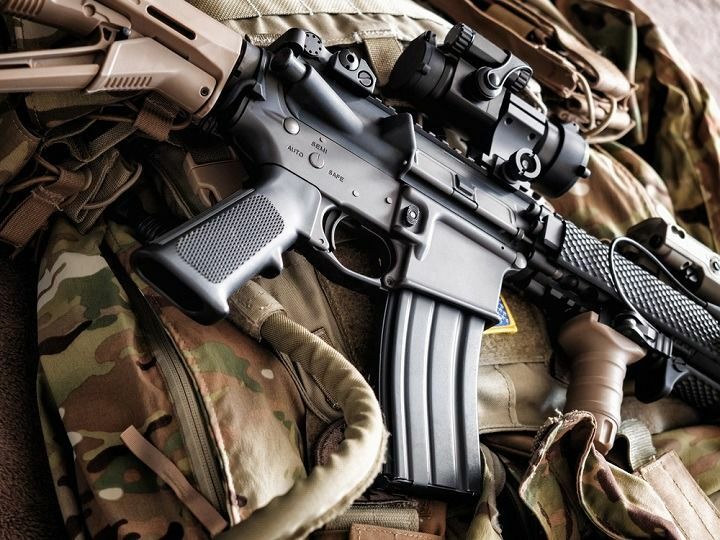 For more options finding the best scope for AR-15, read here. Rimfire guns are small, lightweight, and fun to shoot. They aren’t serious weapons, but fun guns designed for hunting, plinking, and pest removal guns. Rimfire scopes are easy to find and affordable, the BSA Sweet 22 is a great little optic that’s designed for rimfire rounds. 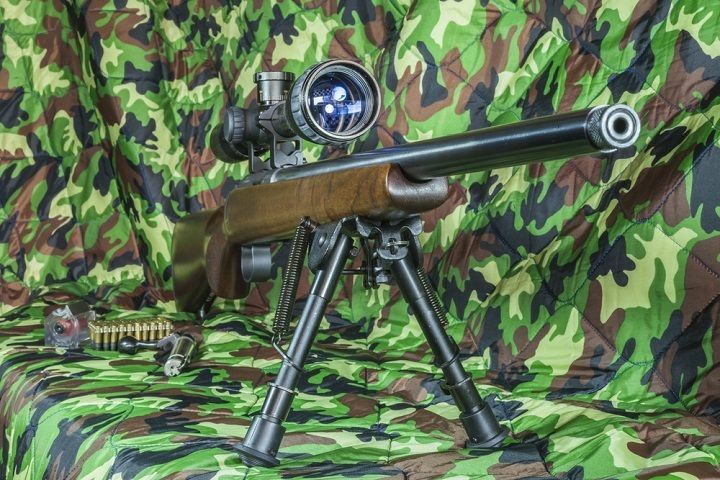 The BSA Sweet 22 is a 3 to 9 power optic that features a full sized 40mm objective lens. This little scope is perfect for shooting targets, training new shooters, and hunting. The optic is shock, fog, and waterproof as well. The BSA Sweet 22 also features a bullet drop compensator that allows you to accurately place rounds as they drop over longer ranges. The BSA Sweet 22 is a straight shooter that makes taking the bull’s eye out a target easily. When we say M4 we don't necessarily mean the actual M4, but M4 clones. M4 clones are direct clones of the actual military M4 without the option for full auto fire. When it comes to cloning the M4 there are only a few options, and the best M4 scope is the Trijicon ACOG. 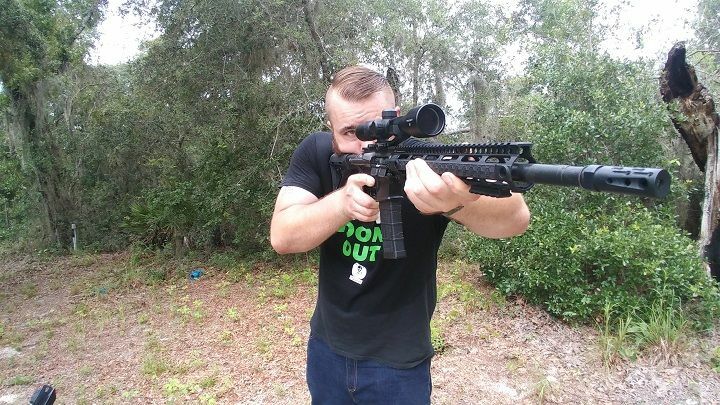 Check any Trijicon scope review and they’ll reinforce that the ACOG is one helluva scope. The Trijicon ACOG is a rifle combat optic design for short to moderate range engagements. The ACOG is one of the toughest optics out there. It can be used for a variety of roles but is built around combat. It’s a fixed 4 power scope that uses the power of the sun to power its red reticle. This optic also makes use of a bullet drop compensating reticle and goes out to an optimistic 800 yards. The ACOG is a rock solid performer, but it does come with a premium price tag. Is it worth it? You bet it is. Purpose Built AK scopes are a little harder to find than your standard AR scope, but they do exist. Bushnell’s newest AK line of optics is specifically tuned to the AK and the 7.62 x 39 cartridge. This makes it one of the best scopes for the AK 47. The Bushnell AK optics is a 1 to 4 power scope so it’s nice and versatile in terms of what it can do. The illuminated reticle is easy to see, and even easier to use. The design is perfect for engaging targets at 3 yards to 300 yards. It does utilize a bullet drop compensator that works brilliantly. 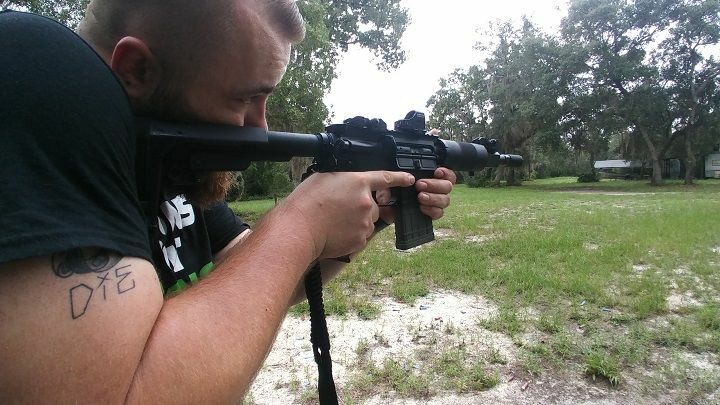 This is easily not only one of the best AK scopes, but one of my personal favorites. It’s well made, easy to use, and very versatile. The illuminated reticle can be used as a red dot up close, and then for precise shooting out to some real distances. The scope is also water, shock, and fog proof. It’s got an excellent long eye relief for mounting on side scope rails, as well as fully multi-coated optics. This well-made scope is easy to use, and perfect for any AK series rifle. Shotguns and scopes rarely go together. Shotguns are basically short range powerhouses so why add a scope? Well if you want to get the most out of slugs then a shotgun will do it for you. 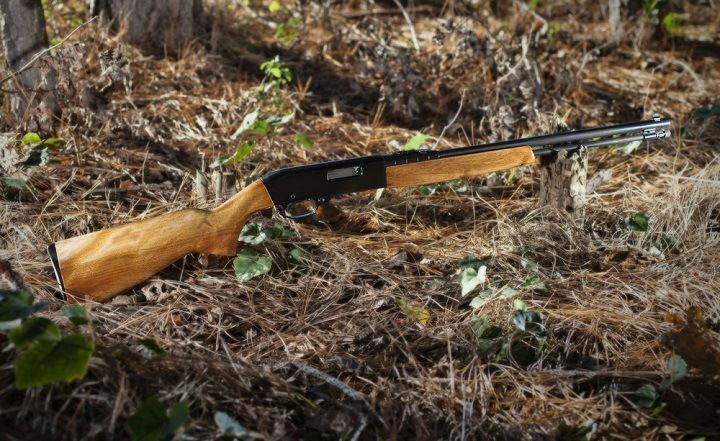 A slug gun is a common name for a shotgun set up for slugs. The Simmon Pro Hunter Shotgun scope is a 4x32 fixed power scope. This 4x magnification makes it a great choice for extended range shooting and allows you to really reach out there and touch a target. The Pro Hunter Shotgun scope is built from the ground up to withstand the recoil from a 12 gauge slug gun. The simple reticle is quick to get on target and precise enough to place shots exactly where you need them. The Pro Hunter is an absolute game changer for slug hunters. It’s simple but effective and capable. If you want to maximize the range you have with a slug gun then you need a shotgun scope. You’ll see your accuracy, range, and precision increase significantly with the addition of a scope. The Simmons is a compact and lightweight choice that will keep your gun nice and easy to maneuver and swing around. The Simmons Pro Hunter is my choice for the best shotgun scope. SPR stands for Special Purpose Rifle and is typically associated with the military’s own Mk 12 SPR. They've since become their own brand of AR rifle. An SPR is typically an AR platform that’s been accurized and designed for precision shooting in combat scenarios. With that in mind the best SPR scope, in my opinion, is the Leupold Mark 6 3-18 power optic. This dynamic and expensive optic is a very capable option for a combat-ready optic. The magnification range makes it quite versatile for both close and long range engagements. You can hit targets both near and far with the Mark 6. It's a powerful optic that can take a beating and just keep coming. The SPR is a go to war rifle and the Mark 6 is a go to war optic. 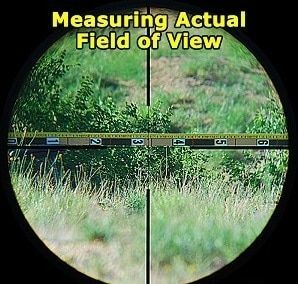 Looking through the scope gives you a crystal clear sight picture that allows you to see and shoot just about anything within the range of your rifle. This level of clarity allows you to tell friend from foe with ease, as well gather and scout information that could be critical. Without a doubt, the Leupold Mark 6 is the best SPR scope out there. Hunting with a handgun is a dynamic and challenging art that requires some serious precision and perfect shot placement. When you step down to a pistol caliber you’ll need to make sure your shots rang true. A pistol scope is one way to get a better bead on your target. The Simmons ProHunter pistol scope is the perfect addition to your magnum powered handgun. The ProHunter is a fully multi-coated optic with high-quality optical glass that provides a bright and sharp image. This allows you to see your game animal of choice and place shot after shot with precision. The ProHunter allows you to reach out and put an animal down with a single, cruelty-free shot. The ProHunter features the TrueZero windage and elevation adjustments that ensure your gun stays zeroed regardless of the recoil that punches through the optic. These are our scopes of choice, and we hope you learn a thing or two from our selection. Hopefully, we’ve also made it easy for you to find an optic for your specific need. The optic’s world is massive, and this list hardly touches on everyone’s needs and wants. However, the optic’s above are rock solid and reliable. Part 5: How to Mount a Rifle Scope? Mounting a rifle scope correctly is critical to the function of your rifle and the scope as one unit. If the optic is mounted incorrectly, you’ll have issues with zeroing and consistent shooting. Luckily, doing it right is pretty simple. One of the most important steps is to take your time and choose your equipment wisely. An expensive scope in cheap rings doesn't make much sense. Rings and scope mounts are critical components so don’t cheap out on them. It should go without saying that you need to make sure the rings match your scopes size. Most scopes use 30mm or 1-inch tubes, but there is variance so double check to make sure your rings or mount match your tube. Also, take your time. Some optics, like most red dots, come with an integral mount and it’s a simple process to mount the scope to your gun. However, for variable optics, you’ll most likely have to buy a one piece mount or rings. You then have to mount the rings or mount to the gun and then the gun to the optic. This isn’t something you want to do at the range. Instead, have a functional workspace and don't rush yourself through the process. Always ensure your weapon is unloaded of course, and take the time to set the perfect eye relief so that you have the brightest and fullest picture possible. Taking your time ensures the scope is going to be set to the correct angle and everything is perfectly straight. If not, your precision and any windage or elevation marks are going to be all over the place. The same goes for the tools you’ll need to install the scope rings to the rail and the scope to the rings. You want quality tools that allow you to control the pressure you use to mount the optics to the gun. If you can’t manage the tools you may mar, strip, or break these small screws. Once they are stripped you’ll have to remove and replace them, which will take even more time and effort. It’s best to do it right the first time. Remember that your objective lens will determine how low you can mount the optic. A high mount is going to be needed for bigger objective lenses. The end goal should be to install the scope as low as possible on the gun. This will aid in precision and make zeroing much easier. Plus it makes it easier to engage the cheek rest when looking through the scope fully. Lastly, but some Loc-Tite, or similar adhesive. Once everything is mounted correctly, you need to lock it down. These adhesives are necessary because of guns recoil, which creates vibrations, which loosen screws. When this happens your scope will shake loose and well, you are out of commission. Just a couple dollars means the difference between a fun day of shooting and trying to diagnose a wandering zero. How To Mount a Rifle Scope? Part 6: How to Sight in a Rifle Scope? Zeroing most optics is a simple affair that’s going to take some ammunition, some range time, and a little bit of patience. The key to zeroing a rifle is to get consistent results. Different scopes are zeroed in different ways, so it can be a challenge to write one guide for all optics. Small details like the appropriate range and magnification needed to zero the gun can be different between scopes. So this will be a bit of a general how to, not a detailed explanation for your exact optic. If possible, the first thing you should do is laser bore sight your optic. A laser boresight is a small device that fits at the end of your barrel and emits a constant laser. Align that laser onto a piece of paper, or clear background and then look through your scope. What’s likely is the center of your crosshair will be off from where the laser is. Our goal is to align the laser with the crosshairs. Step one is to start manipulating the up/down and left/right turrets. Start move one or the other and observe it then the scope. Adjust the reticle until it’s on top of the laser. You are now laser bore sighted. Next, go to the range and start at either where your scope manual says, or around 50 yards and get into a stable shooting position. You want to be stable, and using a gun rest of some type is indeed a help. The more stable your rifle, the easier it will be to zero. Use an excellent, big target. The first step is making sure you are on appear. Fire a few shots, confirm you are on paper. Also, note how far away you are from the target, and using your scopes manual see how many clicks equal an inch. From you dial in your scope. You dial in the appropriate adjustments for your estimation of how far you are off from the center and fire three rounds. I always use three rounds for consistency’s sake. This way I know I didn't throw my shot on the first try. If all three are in a similar area I know I'm consistent and the scopes need adjustment. From here it’s a game of bracketing the scope into being zeroed. Shoot, adjust, shoot adjust until you get in dialed into zero. Once you are hitting the bull’s eye consistently shoot a few more groups and make sure everything is nice and tight. From that point, you can back off to 100 yards, or 200, 300, etc. and check your zero and make adjustments for the range you plan on shooting at. One big key to maintaining the most precise zeroing is using the same ammo over and over. If you zero for cheap FMJ loads, it may be off when it comes time to load a soft point hunting round. Your bullet’s weight, propellant, FPS, and more all come into effect when you begin zeroing your rifle. How to Properly Zero a Rifle in Five Steps? Part 7: How To Maintain and Store a Rifle Scope? The thing about scopes is that they are made of aluminum, glass, and often feature some form of electronics for illumination purposes. They aren’t brittle or delicate, but they can still be easily damaged and brought out of peak condition by improper storage. Also, scopes require a little bit of care to keep them running their best day in and day out. The first thing you should know about scopes is never to take them apart. Not only will this void your warranty, but you’ll likely destroy your scope. You’ll undoubtedly lose any nitrogen or argon purging you have to keep your scope fogproof. You also shouldn’t need to ever take your scope off your gun for necessary maintenance. 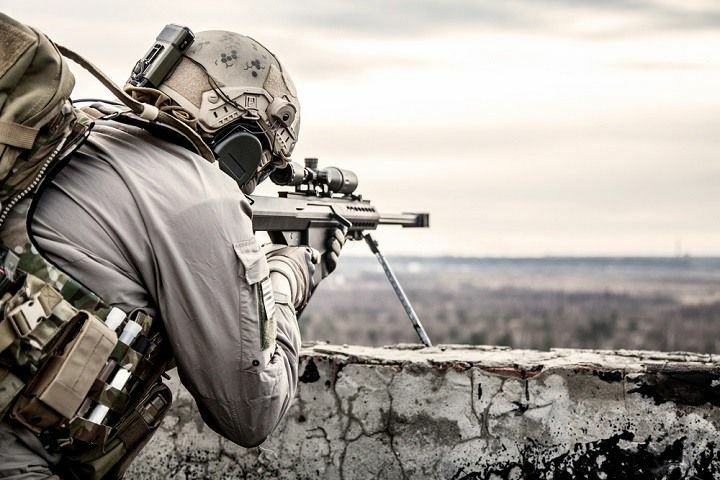 Dismounting and remounting your scope is a hassle and you’ll likely compromise your zero. So avoid that unless necessary. The first thing you need to do is observe the scope for any cracks, corrosion, or other external issues. Breaks mean it needs to go in for warranty work or replacement. Corrosion can be cleaned off with gentle scrubbing. Dust the scope off, and give it some love. The lenses should never be touched by the bare hand. Instead, invest in an affordable and easy to find lens pen. These lens pens are soft bristled and allow you to remove any stuck on dirt or grime safely. Leaving this dirt and grime on can damage the precious lens coatings you use to protect your scope. So can using too abrasive of cloth or brush. For removing any smudges on your lens start with a chemical free, and clean microfiber cloth. Never use cotton, stip to microfibers. Gently and carefully wipe the lens off without scrubbing too hard. If you get something crazy like pollen or water spots on the glass you need you get a little lens cleaner and gently use a microfiber cloth to buff it out. Storing a scope is easy if you have a big safe and only a few rifles. You generally don’t want to jam an optic equipped gun into a safe that’s overflowing with freedom. Give it room to breathe. 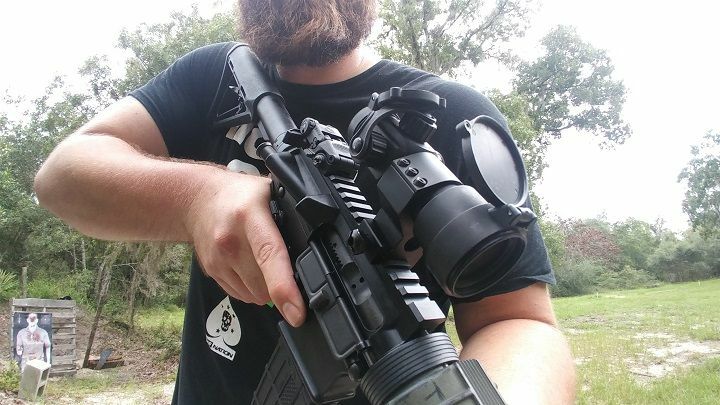 Most scopes come equipped with lens covers, and I suggest holding onto them. If not, they are certainly worth purchasing. For just a few dollars you can protect those fragile lenses from being exposed to the gun safe elements. They come in plastic, rubber, and synthetic material. 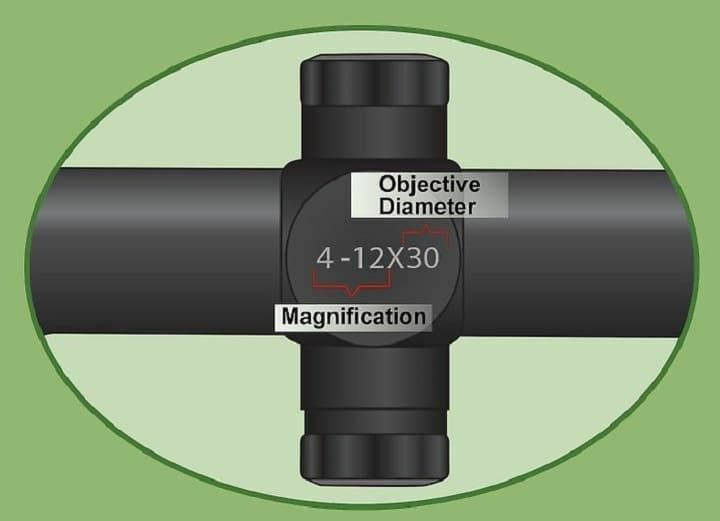 They are often fitted for specific length scopes and objective lenses, so make sure you know your scope’s dimensions. You certainly want to ensure your gun safe is as humidity free as possible. You can do this through electric dehumidifiers, or those safe sized amounts of desiccant material. These will keep your scopes and your guns dry and rust free when stored for long periods of time. I do want to say that when you are cleaning a gun that has an optic also take your time and be careful. 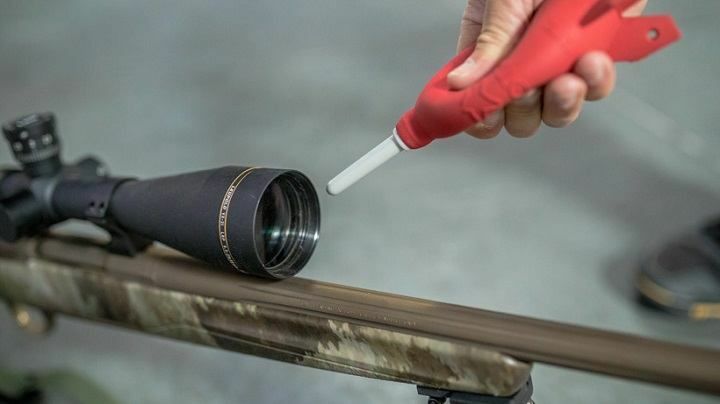 Cleaning a gun often involves harsh chemicals that can damage your lenses. Keep the lens covers on as you clean your gun and you’ll thank me later. With so many scopes out there it’s easy to make mistakes when you start shopping. These are typically costly mistakes. So let’s cover a few of the most common and maybe we can help you avoid making an expensive mistake. This is easily the most common mistake to make when purchasing ascope. People chase that big magnification level or that large objective lens thinking bigger is better. In some situations, bigger can indeed be better. If you are shooting at targets more than a thousand yards, or a mile or two, then go big. If you aren't, you probably settle for something a little smaller. 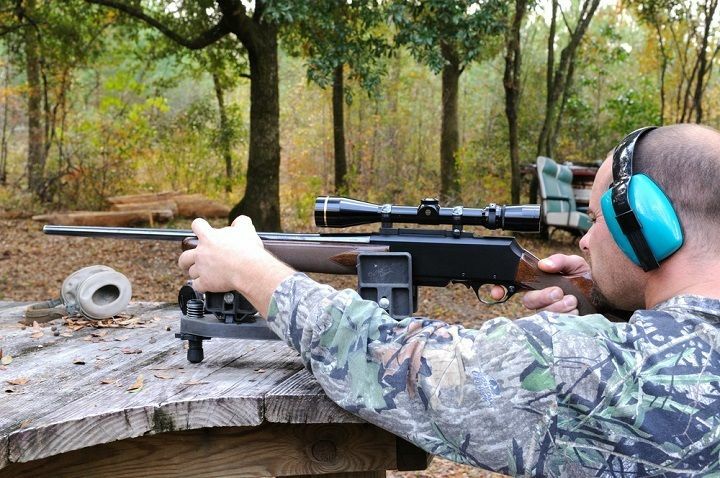 Purchase a scope appropriate for your activity, your rifle, and your cartridge. What’s the point of a 1,000-yard scope when your round is only useful to 800 yards? Let’s say you are buying that big scope, how much are you spending on it? A high powered scope is not a cheap or even affordable scope. Be prepared to spend thousands of dollars, especially for thermal scope. There is undoubtedly a place for budget scopes, but they aren’t for severe activities like hunting, home defense, or duty use. The price of the scope is going to be relative to what it does. So if a red dot scope promises to be waterproof to 100 meters, work for 50,000 hours on a single double-A, and be night vision compatible it’s going to cost more than 50 bucks. Scopes for action shooting, plinking, or other less critical hobbies can be affordable, or budget options. Just don't expect the world out of them. There is no perfect scope for every situation. If a scope is good at one thing, it won't be good at all things. Everything is give or take. If your gun fills multiple roles you may need various optics. (Albeit you risk having issues with your zero in this situation.) Pair your weapon and your optic to its primary task at hand. This is another major issue I see. People buy scopes with overtly complicated reticles designed for long range shooting and go target practicing at a100 yards. At that range, all those holdovers for windage and elevation are simply gunking up the screen. Another issue is the use of bullet drop compensating reticles on guns and with calibers they aren’t designed for. BDCs are tuned explicitly for one caliber in most cases and fail on anything else. Be picky with your reticle, but also be honest with yourself. The last fatal flaw is not knowing or understanding your warranty. I always choose the best rifle scope that have solid warranties. Limited lifetime or lifetime is the most important to me. I want a company that stands behind their product and protects it. A warranty protects your potentially expensive investment. Thanks for joining us today. We hope you learned a thing or two. You should approach optic’s purchasing with a bit of common sense and a little education on the subject. The more you know, the less intimidating it can be, and the better chance you’ll have of finding precisely what you need. Stay safe and shoot straight. If you found this guide helpful, please help to share it using the share buttons below, and please share your thoughts with us using our comment form. I’m getting a rifle so I can go hunting with my boyfriend, and I was considering getting a scope to go with it. I noticed some scopes talked about long eye relief, but until I read your article I thought that was something to do with the focus to avoid eye strain, though now I know it’s to avoid the rifle hitting your eye! I think I’d need a longer one anyway; I’ve never used a rifle before and probably will get hit by the recoil if I don’t have enough space.